My favorite number is 7. 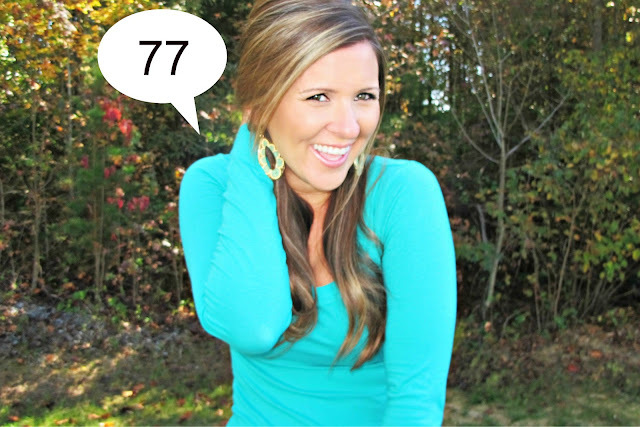 Driving home from the airport the other night, I was thinking about 77. It dawned on me that this freeway has quickly become my everything. 77 takes me to the airport. 77 takes me up to my favorite local wineries. 77 takes me to the mall and Trader Joes. 77 takes me up to my relatives in Pittsburgh. Some of the most important things to me are found off of I-77. I love driving on this simple freeway, crossing over Lake Norman and admiring where I live. I was born on the 7th of April. When I was little, I was in Hawaii and found a shell with the number 7 etched into it. Since finding that shell, 7 has been my favorite number. Ben Roethlisberger's number is 7. 7 is known to be a lucky number. It's only fitting that I live off of I-77. I'm where I'm meant to be! My favorite number is 12. And my 30th birthday this year will be 12-12-12. I have a feeling this could be a great year!!! Oh I love this post! My number is '111' - see it everywhere! I love 7 too! Even got married on 7/7/07!